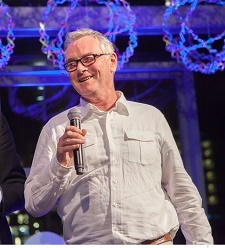 Peter Kennedy has been in business since 1991 designing, installing and servicing marine electrical systems. The purpose of this blog is to offer support to both professional installers and do-it-yourself boat owners who wish to undertake this work themselves. Please use Victron VE Bus cables to hook up Victron VE Bus equipment. I'm building a complete Lithium Battery System as a demo to take to the Annapolis Boat Show. As I build the system I will be writing about it in this blog post. So check back again as this post will change from day to day. This blog post describes the system and some of the logic behind it and Part II of the Post describes the detailed design and construction of the system. 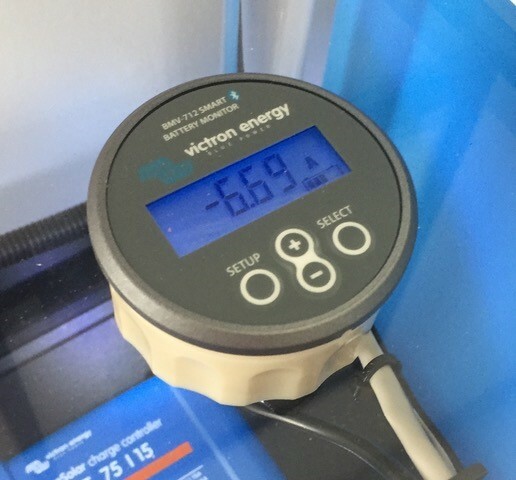 The battery we are using is the 12 Volt 200 Amp Hour Smart Battery from Victron Energy. They call it a smart battery because it has built in Bluetooth and you can connect to it through an App on your phone to read the voltage and temperature of each cell. You can click on the picture and all the pictures in this blog to learn more about the product. Here is a link to the installation. Simply put, these are extremely high performance batteries with substantial savings on weight and size coupled with a much longer lifespan than conventional batteries. If you compare this battery to a Lifeline AGM you will see that the lithium is good for 5000 cycles at 50% discharge and the Lifeline is good for 1000 cycles. 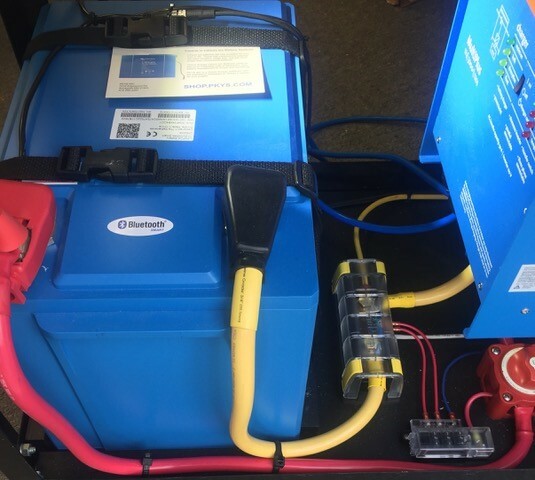 With the Lithium battery you can use almost all of the power but with an AGM you should only discharge it 50% of its rated capacity to have any kind of lifespan. A Lifeline 4D AGM battery is rated at 210 Amp hours, the closest I could come up with. You would need to have two of them to match the Lithium. Then you would have to replace them five times during the life of the Lithium. So although the Lithium battery is expensive comparing it to 10 Lifeline 4D AGM's makes it by far the better deal. A pair of 4D's weighs in at 248 Lbs but the Lithium weighs 93 Lbs and takes up substantially less room. Lithium batteries are more complicated than regular batteries. They mustn't be overcharged and then mustn't be allowed to run flat. The individual cells in the battery need to be balanced. All this is the job of the Battery Management System (BMS). The BMS will send a signal to disconnect the load from the battery if any cell gets to its minimum voltage and it will also send a signal to turn off the charge if any cell reaches its max voltage . 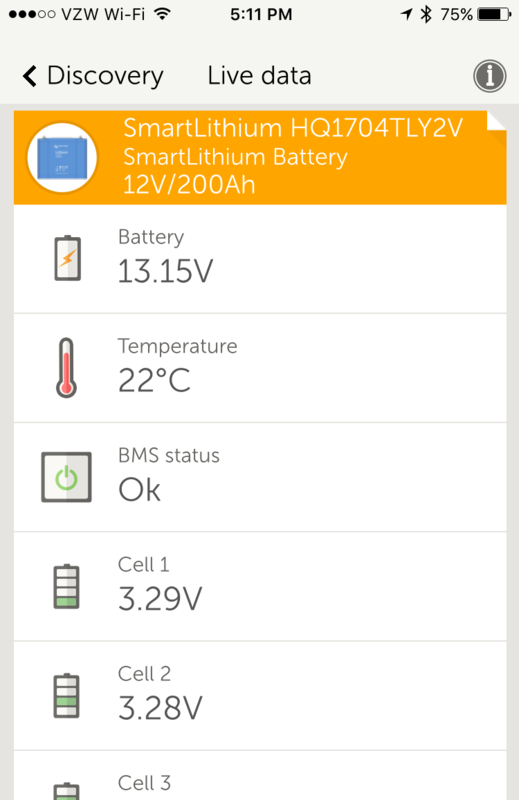 In the Bluetooth screenshot the cells are a little out of balance, one is 3.28 Volts and one is 3.29. This is because when this screenshot was taken the battery had been offline for a week and is not connected to a BMS. The BMS I am using in my project is the VE Bus version and so it can talk to the Multi-Plus inverter charger digitally and tell it to stop inverting if the battery gets low and stop charging if the battery gets full. 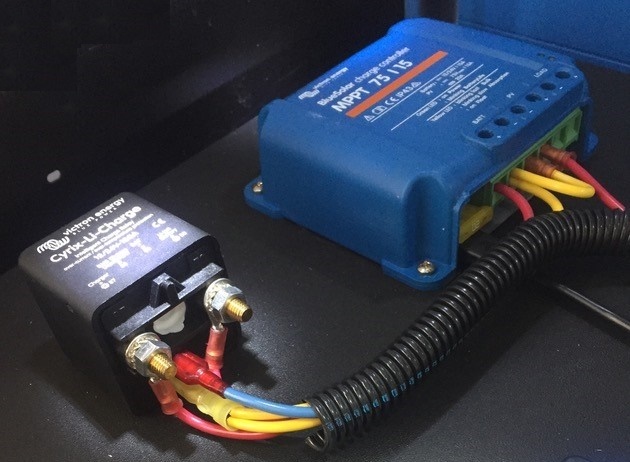 The VE Bus BMS has a pair of data terminals that connect to the battery directly and a VE Bus port that connects to the Multi-Plus inverter charger. 1. Disconnect or shut down the load whenever the voltage of a battery cell decreases to less than 2,5V. 2. Stop the charging process whenever the voltage of a battery cell increases to more than 4,2V. 3. Shut down the system whenever the temperature of a cell exceeds 50°C. The photo above shows the VE Bus BMS. The black cables are the data cables to the battery. The Blue Cable is the VE Bus cable to the Multi-Plus Inverter/Charger. The light blue and tan wires go to the load disconnect and charge disconnect relays, and the other wires are its power supply. 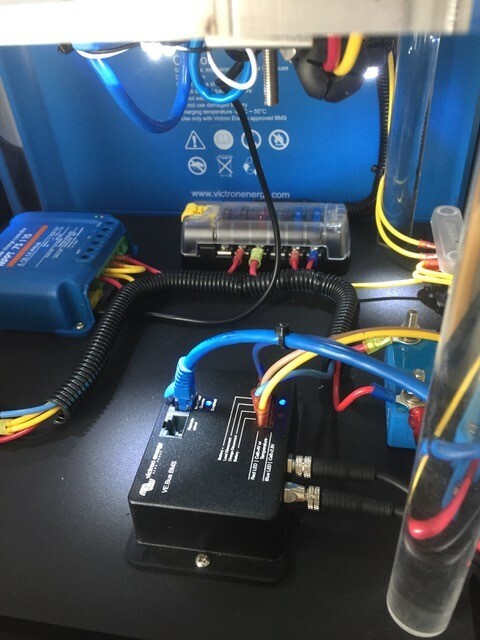 We have set up the Battery Protect to disconnect everything in the system except the BMS itself and the Battery Monitor. We need the BMS to stay working so that the system will restart when a power source is applied, and we need the battery monitor to stay on so we know the state of charge. In the photo of the Battery Protect above you can see the red power wire coming in and going out and the tan signal wire from the BMS. The digital display in the lower left is only used for programming. The Battery Protect in the picture is the smallest 65 Amp model since this is only a demo system, but there are solid state relays available in a variety of sizes. 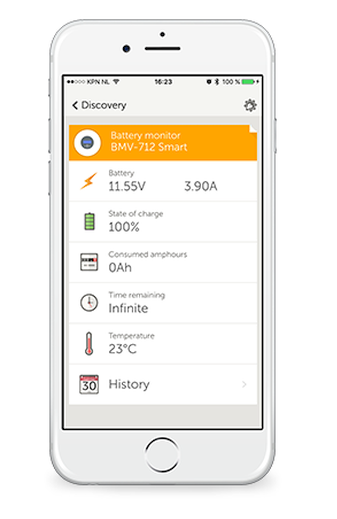 We are using the BMV 712 Smart Battery Monitor with Bluetooth to keep track of the state of charge of the battery. This measures voltage, amps going in or out of the battery, and uses that information to calculate the state of charge and the time remaining to full or empty. It has built in Bluetooth and can read out on a phone or tablet. 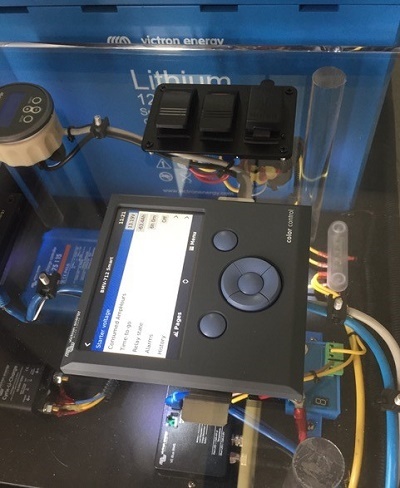 The Bluetooth connection can be used to display the battery voltage, how many amps are going in or out, the state of charge in %, the time to go to full or empty and the amount of energy consumed. It can also be used for programming and setup, and it maintains a historical record of battery performance and statistics. 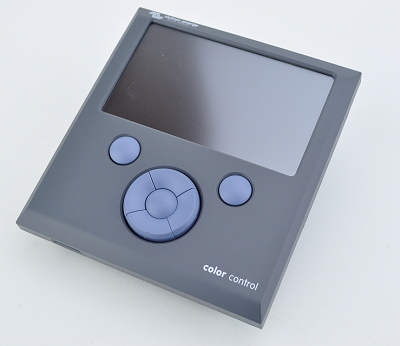 The system display is the Color Control GX. It is entirely optional but is a great way to display graphically what is going on with the system. It connects together all the different data streams and displays them in a logical way. 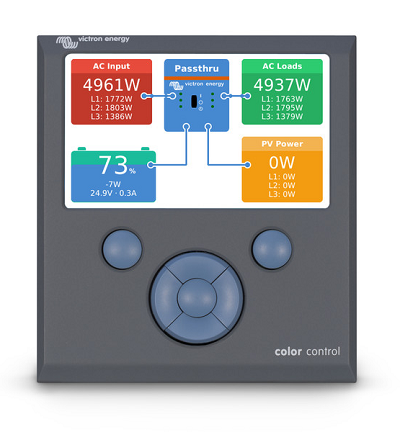 In our demo system we have only the basic information available but the Color Control can be connected to a NEMA 2000 network and can also be connected to tank gauges and other equipment. Our system has a WiFi module plugged in and is connected to the Victron VRM Portal so the system can be monitored remotely. 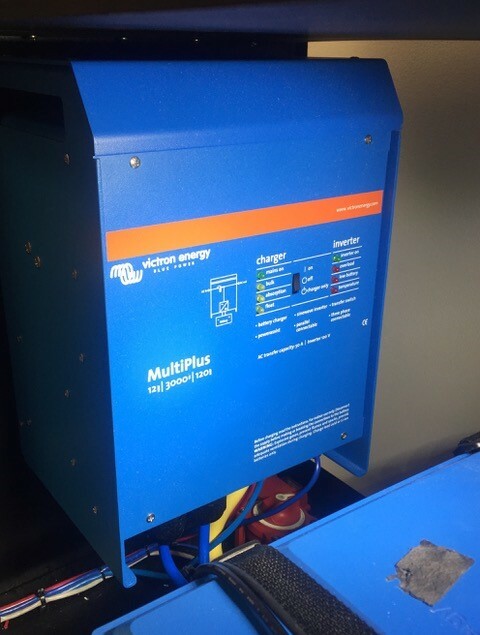 We are using the Victron MultiPlus 12/3000 inverter charger and have programmed it for Lithium Ion Batteries and set it up to be controlled by the BMS. We are also using the digital multi control because in our demo system we want to be able to control how much AC Power we take from shore to avoid blowing all the circuit breakers at the Boat Show! The MultiPlus is a compact 3000 VA Sine Wave inverter with a built in 120 Amp three stage battery charger. Programming of the MultiPlus was done with a PC using the MK3USB interface. 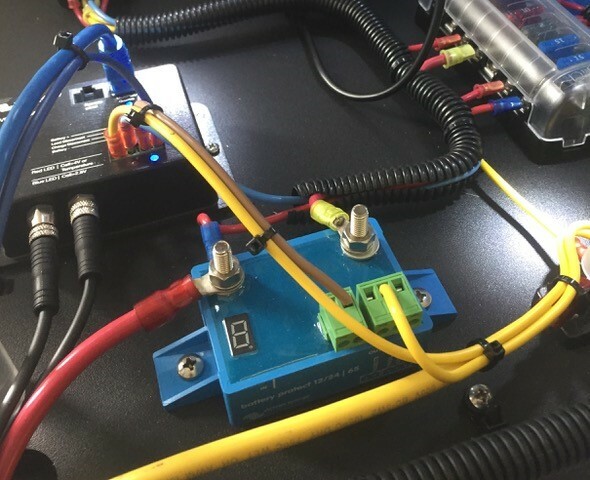 As well as selecting the battery type as Lithium we adjusted some of the setting manually as detailed in Part 2 of this blog and we also downloaded a small program called an "Assistant" which defines the parameters under which the inverter charger operates when controlled by the BMS. Last but not least is the battery itself. We are using the 12 Volt 200 Amp Hour Lithium Iron Phosphate Smart Battery with built in Bluetooth. A Lithium Iron Phosphate battery like this does not need to be fully charged to perform correctly. Service life even slightly improves in case of partial charge instead of a full charge. This is a major advantage of Lithium compared to lead-acid. Other advantages are the long life, reduced weight, reduced volume, wide operating temperature range, excellent cycling performance, low internal resistance and high efficiency. The nominal voltage of these batteries is 12.8 Volts and that voltage is very stable throughout almost the entire state of charge resulting in better performance of sensitive devices like inverters. The efficiency rating is around 92% The battery weighs in at 42 kg or around 93 Lbs. The approx dimensions are 12.5 inches high x 17.75 inches wide x 10.5 inches deep. You can look online at the Victron VRM Portal and see how our demo battery is doing, you can get it to show a graph of voltage and current. In the first test, before we went online with the battery, we discharged 194 Amp Hours from it and the output voltage was still 12.8 Volts. Read up on a discussion of how big a battery bank to select.